Marvel has, quite literally, kicked off the official countdown to Spider-Man: Far from Home. Fans of the Marvel Cinematic Universe caught a break when The Amazing Spider-Man 2 sort of fell short of expectations. That led to Sony finally cutting a deal with Marvel Studios, allowing for Spidey to join up with his fellow Avengers on the big screen. First, in Captain America: Civil War, before getting his own solo movie last year with Spider-Man: Homecoming. Now, the countdown to the sequel is underway. 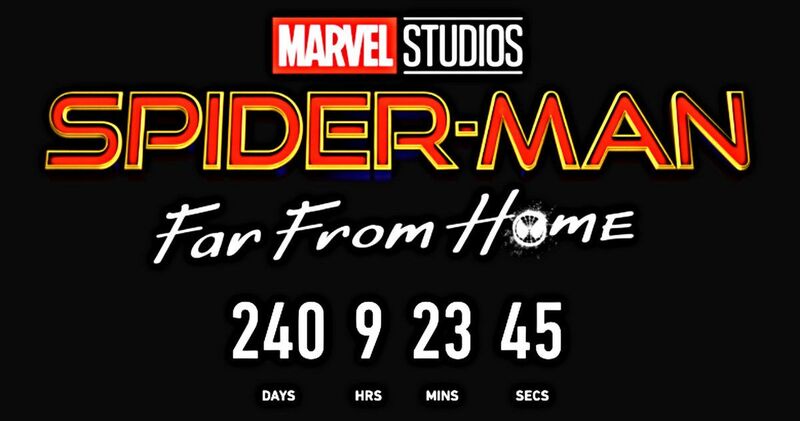 The Marvel website recently did a little updating and at the top of the page for Spider-Man: Far From Home, there is a countdown clock alongside the movie’s logo, literally counting down the seconds until the sequel premieres in theaters. For those that don’t need a to-the-second update, we currently have 240 days to go. Does the introduction of this countdown mean that we should expect some sort of reveal about the movie sometime soon? Not necessarily, but one can dream. For the time being, we’re just going to have to wait until the studio decides to release a teaser trailer, which might not be for a little while. Given the events of Infinity War, which saw Thanos literally turn Peter Parker into a pile of ash, there are a great many questions fans have heading into the sequel. How is it that Peter will be back, chief amongst them. That, and many other questions, are set to be answered in next summer’s Avengers 4, which will conclude Phase 3 of the MCU. Spider-Man: Far From Home has the dubious honor of being the first movie in Phase 4, meaning it has to follow up what should be one heck of an event. On the one hand, this could be a nice palate cleanser, but that doesn’t mean there will be any less pressure for the movie to deliver the goods. In terms of plot details for Spidey’s next solo adventure, not a whole lot has been revealed up to this point. What we know for sure is that the title refers to the fact that this installment is going to see the web-slinging hero hanging out abroad in Europe, which is something new for the franchise. We’re also going to see a brand new fan-favorite villain in the form of Mysterio, set to be played by Jake Gyllenhaal and yes, believe it or not, it even looks like he’s going to have his fishbowl helmet, which is pretty incredible. Jon Watts, who successfully helmed Homecoming to the tune of $880 million worldwide, is back in the director’s chair. Save for Tom Holland, who once again returns as the titular hero, the cast includes Zendaya, Jacob Batalon, Michael Keaton, Samuel L. Jackson, Cobie Smulders, Marisa Tomei, Tony Revolori and J. B. Smoove. Spider-Man: Far From Home is set to arrive in theaters on July 5, 2019. Those interested can head on over to the official Marvel website to check out the countdown clock.